What Kuala Lumpur lacking to be Asia number 1!!!! It is not the tallest building in the world, not the tallest telecommunication tower nor longest bridge that really matter. It is FENG SHUI MATTER. Malaysia is well endowed with natural resources in areas such as agriculture, forestry and minerals. In terms of agriculture, Malaysia is one of the top exporters of natural rubber and palm oil, which together with sawn logs and sawn timber, cocoa, pepper, pineapple and tobacco dominate the growth of the sector. Palm oil is also a major generator of foreign exchange but Hong Kong and Singapore has none! Malaysia should out phasing Singapore as well as Hong Kong in many aspects but she did not! The reason is simple; the capital city is lack of WATER!! Let us use basic Feng Shui principle of rear should have support and front should have water element. 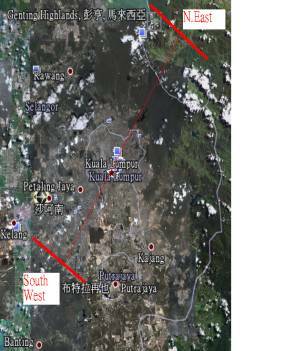 Kuala Lumpur would use the vicinity peak at the rear, as the mountain for support and that should be the Genting Highlands. 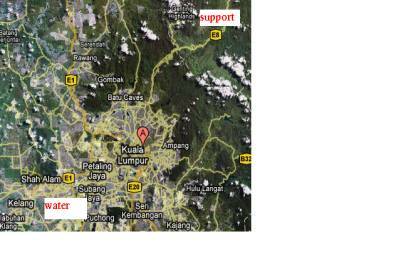 (See below Google Map) We did not see any water element near the Southwest of KL. Genting Highlands (About 1850m above sea level) is a mountain peak within the Titiwangsa Mountains on the border between the states of Pahang and Selangor of Malaysia. The driving distance to Kuala Lumpur is approximately in one hour. What Malaysia need is the perhaps the biggest water fountain, pond (require revolving type) or lake in the region or at least in Malaysia. Let’s compare the three cities basic demographical stats from Wikipedia. In the case of Kuala Lumpur would want to get the engine going to improve the quality and standard of lives, just one simple thing will get all the acts together and keep moving forward. It is FENG SHUI MATTER! With the immediate action (to build the long needed water element) in this period 8 (now till 2023), we would see the increasing importance of Malaysia in Asia next to China and in the Period 9 (2024-2043) we would see the presence of Malaysia would be respected in the world arena.